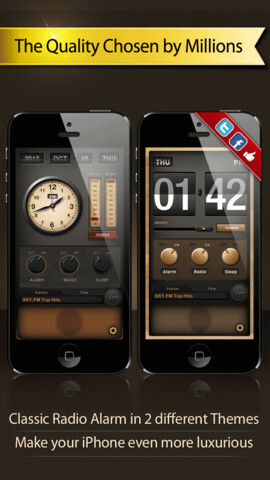 Radio Alarm Clock Free is an iPhone app developed by EnSight Media. The top-selling app in Brazil, Japan, South Korea, Belgium, France, Spain, Hungary, and Lithuania, Radio Alarm Clock Free is ready to win you over, too. Let’s start with the well-designed interface, which is simply gorgeous. It’s leathery and buttery, like your iPhone had a baby with a Victrola. In addition to being easy on the eyes, Radio Alarm Clock Free is also very easy to navigate. 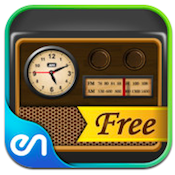 Radio Alarm Clock Free is the lite cousin of the full version, but the free app is a solid piece of app-ness that’s nothing to sneeze at. True, the banner ads and occasional full screen ads are annoying. 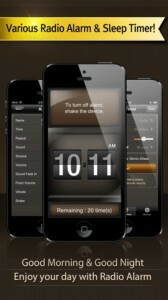 But the overall look of Radio Alarm Clock Free is barely affected by it. 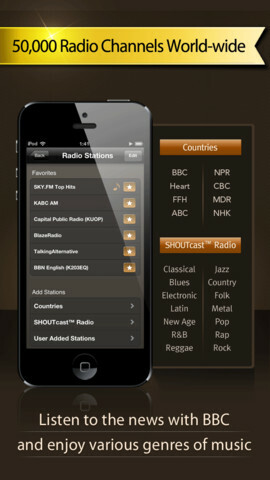 The radio in Radio Alarm Clock Free is powered by ShoutCast, giving users access to over 50,000 channels. You can search for a station by country or state, or look up a user-created station. You can also search by genre as well. 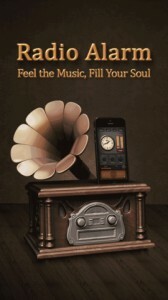 Not in the mood for music? You can turn on some ambient sleep noise (like rain on a window) instead of music. One small detail that makes this music app feel luxe is a simple animation of an old time radio being tuned, in lieu of a “loading” message. You’ll only see this animation after picking a station, however…sadly, the “loading” icon pops up when loading the list of stations, somewhat spoiling the aesthetic of the app. One thing that is a little annoying is the fact that you have to go back several screens to the main clock screen to see the artist and song info, rather than being able to see it from the radio tuning screens. The audio quality of Radio Alarm Clock Free was really surprising. Every channel really seemed crisp and clear, and there were no issues with gaps or skipping in tracks. With a low, low price and great features, Radio Alarm Clock Free is an iPhone app that’s simply music to our ears. While this app may be free, it’s still satisfying to use. Radio Alarm Clock Freeis compatible with iPhone, iPod touch, and iPad. Requires iOS 4.3 or later. This app is optimized for iPhone 5.